Economist Cowen seeks to persuade readers that American citizens have gotten overly complacent, that a crisis point is near, and that a widespread rebellion may alter the existing order. So, what happened? Cowen’s thought-provoking book emphasizes several causes, including geographic immobility, housing prices, and monopolization ... Cowen’s book performs the trick of all successful idea-driven non-fiction. It provides an open invitation for the reader to think deeply, even when deep thinking leads to some disagreement ... The sign of a good book is that it helps readers see the world through a useful lens. Cowen’s book is a full of 'huh, I hadn’t thought about it like that' moments, even on topics that I’ve spent years thinking about. Tyler Cowen is not the first observer to spot the digital world’s spirit of conformism — and he will not be the last. But he is among the most incisive ... One of Cowen’s strengths is his willingness to look beyond economics. Cowen is a polymath, who writes as passionately about ethnic food and foreign movies as he does about patent applications or labour market trends. He does not wait for the data before offering an opinion. That is what makes Cowen’s books so readable. But it also gives fellow academics an excuse to downplay what he is arguing. Much of Cowen’s latest thesis is highly speculative ... Cowen does a marvellous job of turning his Tocquevillian eye to today’s America. His book is captivating precisely because it roves beyond the confines of his discipline. In Cowen’s world, the future is not what it used to be. Let us hope he is wrong. The less complacent we are, the likelier we are to disprove him. As fascinating as Cowen’s analysis can be, his grand thesis is ultimately unconvincing. I had a hard time understanding who exactly composes the complacent class. Initially, Cowen argues that the entire country is complacent, that despite the huge divisions of race and income in America, we are all 'more or less OK with this division of the spoils.' Can this be right? I wanted Cowen to offer some evidence, but I was hard-pressed to find it other than in Cowen’s assertions. Throughout the book, he redefines who it is he’s calling complacent ... Partly because Cowen isn’t clear as to who the complacent class is, it’s also not always clear that his data supports his thesis ... 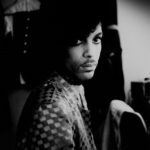 In the end, his point might be that some of us are complacent about certain aspects of life, and while there might be some benefits to this, there are also dangers lurking. Which makes for a book that accomplishes the laudable goal of making you think, if not one that delivers on its title. 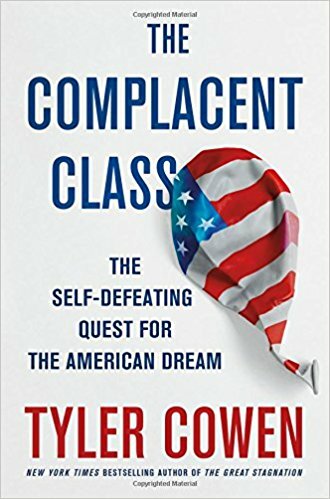 What did you think of The Complacent Class: The Self-Defeating Quest for the American Dream?